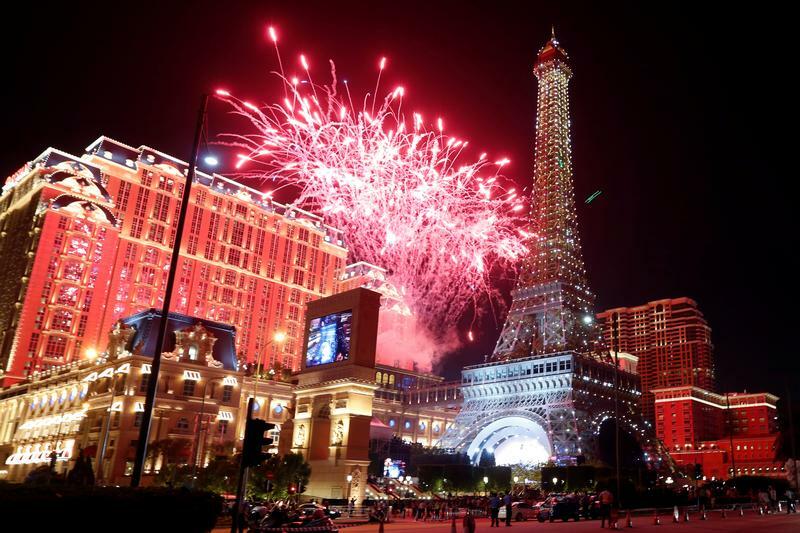 Fireworks explode over Parisian Macao as part of the Las Vegas Sands development during its opening ceremony in Macau, China September 13, 2016. During the Chinese New Year holiday in early February, Macau saw a 26.6 percent jump in visitors compared with the previous year’s festival period, according to data from the Macao Government Tourism Office. Arrivals hit a record 1.2 million persons over seven days, and hotels had an average occupancy rate of 97 percent. Melco Resorts and Entertainment’s adjusted EBITDA grew by 25 percent to $425 million in the fourth quarter of 2018 compared to a year earlier, the group said in a filing on Feb. 19. MGM China's adjusted property EBITDA grew by 11 percent to $167 million during the same period, helped by growing business at its new property, MGM Cotai, the company reported on Feb. 14. Las Vegas Sands grew its Macau operations’ adjusted property EBITDA by 7.7 percent to $786 million, according to a filing on Jan. 24. Wynn Resorts’ Macau properties saw EBITDA grow by 5 percent from a year earlier to $394 million, based on Citi’s analysis of the parent company’s results released on Jan. 30.SJM Holdings and Galaxy Entertainment are expected to release results on Feb. 28.